Mertie Buckman has used her social, business and personal resources consistently for nearly 50 years to make our community more responsible to human rights and to social issues affecting people from all walks of life, regardless of race, religion or ethnic cultures. From sewing clothes for needy children to spearheading creation of facilities like the MWCA’s Raleigh Branch, her work aimed at breaking down the barriers that separate people. A woman with a college degree when very few women achieved that goal, she taught in three states before coming to Memphis where she dove headline into civic work. 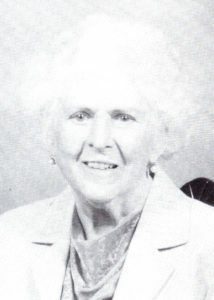 She campaigned for water fluoridation, was president of the YWCA board of directors in 1950 and again in 1970, and a state and local officer of Church Women United. Mertie led the successful effort in 1954 to start a public library in Raleigh. In 1972 she started a YWCA center at Raleigh Presbyterian Church, where she serves as an elder. She was a working board member for the Transitional Center for Women from 1973 until it closed. The Center helped women start a new life after incarceration. Today Mertie Buckman is 85 and still diving headlong into issues and civic work that matter. She is an honorary trustee at Rhodes College, a trustee at Christian Brothers College and on the advisor’s council at St. Mary’s Episcopal School. She is membership chair for Church Women United and a member of the YWCA Advisory Board. In addition to her obvious leadership qualities, her philanthropic contributions reach beyond the scope of her immediate community and probably never will be completely known. Mertie has preserved and steadfastly stood by her principles. She has never wavered from her ideals and continues to strive for her dream of a better, fairer world for us all. In 1923 Mertie was depicted in a marble sculpture call “Essence of Mertie” at Buckman Hall at Christian Brothers University, a rare honor for a Memphis woman.